"People Want Money Back: They Don't Believe It's Me "
AT the beginning of Stephen Sondheim’s 1979 macabre musical Sweeney Todd that tells the story of the legend of the mass-murderer demon barber of Fleet Street, the audience is bidden: “Attend the tale of Sweeney Todd. His skin was pale and his eye was odd. He shaved the faces of gentlemen who never thereafter were heard of again.” A spectacular, revelatory new production of the show opened on Thursday night at the Festival Theatre in Chichester as the climax to a season that has already brought West End transfers for two of its plays with a third booked in the new year for Singin’ In The Rain. Yet surely the West End beckons too for Sweeney Todd which couldn’t be more different to that damp but sunny stage adaptation of a classic film. It has two considerable aces up its sleeve: Imelda Staunton, an Oscar nominee for Vera Drake, is making her long awaited return to musicals that have previously included an Olivier Award-winning performance in another Sondheim written show Into The Woods 20 years ago, and Michael Ball in his first new show since his own Olivier-winning turn in Hairspray. Staunton, best known for playing Dolores Umbridge, Headmistress of Hogwarts in two Harry Potter films, is an expected comic delight but Ball is the unexpected dramatic triumph. When I first spoke to Michael about the show a few months ago, he told me: “I'm really, really nervous about it. It seemed like a good idea at the time. Speaking to him again on Friday afternoon, after his first night triumph the night before, he is more than just relieved to have pulled it off. “I couldn't be more proud and thrilled. It's just been a joy to do from beginning to end,” he beams. In Hairspray Michael simply added a dress and padding but this time he has taken a darker, harsher route. “I wanted to change myself physically and I went through a lot of different ideas. I thought of a shaven headed look at one time. It Is also about the acting. “I’m a big guy and wanted Todd to move very quickly and suddenly but most of the time be totally contained and closed in,” adds Michael. “He’s simmering under the surface. He doesn’t show his emotions until he has his breakdown.” Though he has darkened his eyebrows, the bigger changes come from within. 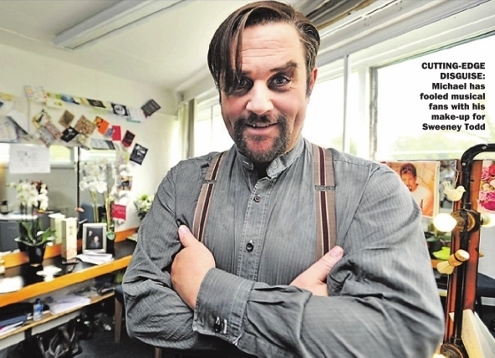 Before beginning rehearsals for Sweeney Todd earlier this summer he embarked on a 22-night national concert tour and a live DVD recording at Birmingham Symphony Hall is being released next month. However, for Sweeney he has had to learn to go even deeper. “I have a high baritone voice but I’ve awakened this bass baritone and can flip into the higher one when I need to,” he explains. “This score requires the biggest vocal range I have ever had to use.” Ball, who last year turned producer for the first time to help transfer Chichester’s production of another musical Love Story to the West End, has also been integral behind the scenes here. “Doing the show was my idea and I got it going,” he says. He even cast Imelda Staunton, first mooting the idea to her when she was a guest on his weekly Radio 2 show Michael Ball’s Sunday Brunch.